For some time now I have been looking at various super wide angle lenses with a Leica M mount for my Leica Monochrom. My widest lens is 28mm and there have been many times in the past when a wider angle of view would have been welcome; either because I am working in confined spaces (church interiors for example) or to work more creatively. For landscapes a wider angle of view can also be invaluable but in all cases the ability to attach Neutral Density and ND Graduated filters is important to me. Yes I know using filters on a rangefinder is far from ideal. It also goes without saying that a separate viewfinder is also a requirement, as the frames lines in the camera’s viewfinder only extend to 28mm. Despite these limitations I still love my Monochrom to bits, so whilst my approach might be very unorthodox, it works for me and I’m sticking to it. So what are the choices. 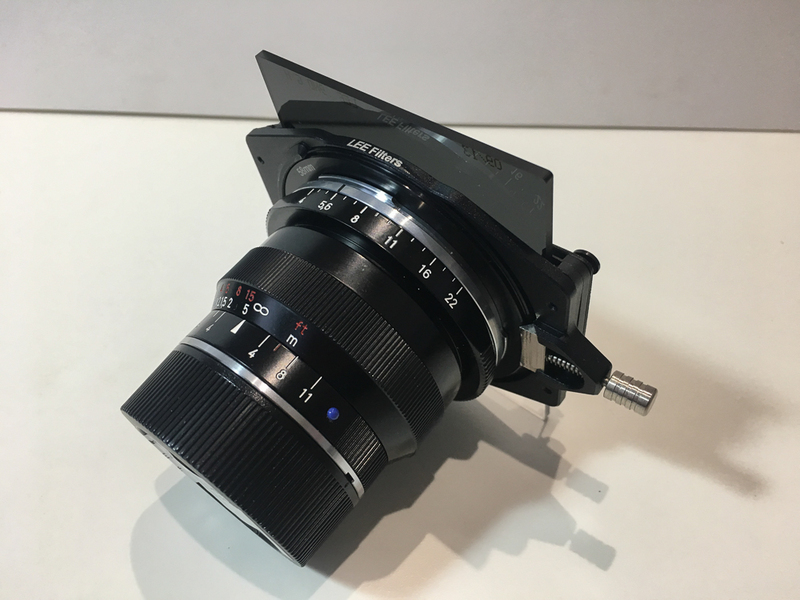 I first considered the Leica 21mm f3.4. A great lens by all accounts, but expensive (approx £2,200 new). A Zeiss 21mm equivalent is also available at around a £1,000. In both cases I would need to purchase a separate viewfinder but could use my Lee Seven5 filter system. However the angle of view is not that much greater than 28mm and I kept asking myself would it be wide enough? Probably not. 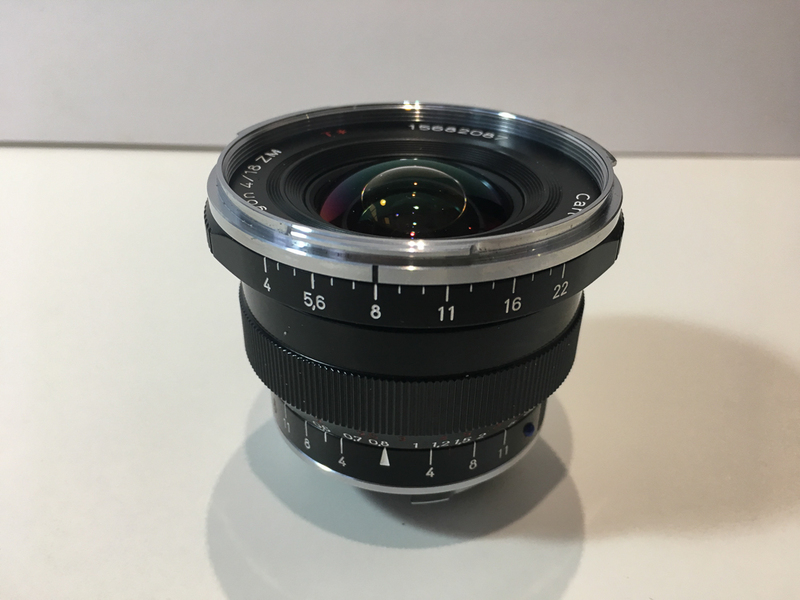 Second option – Leica also have in their range a 18mm f3.8. Similar in price to their 21mm, this lens would be an option but for the fact that the filter ring size is 77mm. The maximum thread size for an adapter ring for my Lee Seven5 filter system is 72mm. The cost of investing/carrying another filter kit just for use on one lens is neither sensible or practical. 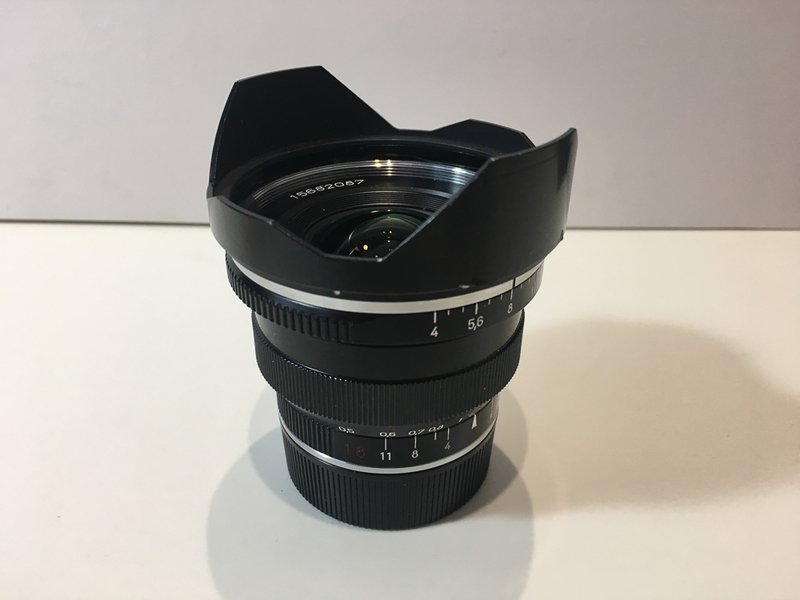 Third option – A Voigtlander 15mm f4.5; price new, a more reasonable £559. Possibly too wide but the biggest problem with this lens was the fitted lens hood. You can’t remove it which makes the lens totally unsuitable for use with a filter system. A design fault ‘par excellence’ if you’ll excuse my french! Third option – Back to Leica and the 16-18-21 Tri Elmar f4. It’s not a zoom lens but you can select any one of the three focal lengths. It will also accept filters with an adapter. What’s not to like? – well the price – a whopping £4,600 (new) with the separate and very bulky viewfinder. Even second hand versions are around £3,000. As much I wanted to shoot wide angle, this was simply too much money to spend on what is after all a specialist and not an everyday lens. Fast running out of options I started to look for second hand lenses. Just a few days ago I came across a lens for sale with Red Dot Cameras, a Leica specialist based in London. They were selling a Zeiss Distagon T* 18mm f4 together with a metal bayonet hood and a Zeiss viewfinder. I had not come across this lens before so I started to do some research. It turned out that this lens is no longer in production. Reviews (very few) were favourable but I quickly discovered that it would accept 58mm filters so could be used with the Lee Seven5 filter system. The 18mm focal length gives a 87 degree angle of view, an ideal compromise between the ultra wide 15mm and the not quite so wide 21mm. Graded at 90% to 95% of original condition with a price tag of £750 it was the solution I had been searching for. Given that the viewfinder alone is £350 new, it didn’t take me long to decide to go ahead. I ordered it online and it arrived by courier the next day. Excellent service as always from Red Dot Cameras. At the weekend my wife and I drove to the seaside town of Eastbourne. Naturally I took a few images just to see how the lens performed. All the images were taken using the Leica M Monochrom. My first impressions are very favourable. I used a lens profile in Lightroom to correct minimal distortion and vignetting. To my untrained eye this seems to work well. In a couple of the images I also used the transform tool in LR (on the auto. setting) to straighten converging verticals etc. I then processed the pictures in Silver Efex until they were to my liking. Disadvantages I hear you ask. Well at f4 it’s not particularly fast but nor are the other options available. The lens is not 6 bit coded so I will need to research the optimum lens profile setting on the Leica Monochrom to maximise its performance. Using two viewfinders; one to focus and one to compose, will take some getting used to, but as with any super wide angle lens the depth of field is so great that critical focusing becomes less of an issue. The creative possibilities of this lens open up new doors for me. I am certainly looking forward to becoming more acquainted with this lens and its capabilities in different shooting situations. Interesting shots already – The boardwalk over a pebble beach, with the three figures, looks like an illustration for a story. Thank you Robert. I agree about the three figures being a possible storyline. First impressions of the lens are definitely positive. I love these photos. Great to see your work. Thank you….I’m pleased you like them. An ultra-wide lens opens up a whole new way of viewing the world. I have a 11-16mm Tokina lens for my DX NIkon, so that equates to about 17.5mm at the wide end. It’s a lovely lens to work with. I’m certainly enjoying it so far. Good sharp lens too. Really enjoyed the read, I have yet to try any Zeiss lenses, glad you found a lens you are happy with albeit with a couple of compromises. Great shots of my home town!